The Ercolina Mega Bender 030 with mandrel system has a work length of 10 feet with a max bending angle of 180 deg. Depending on the material, wall thickness and distance between bends the Ercolina mandrel system can accommodate centerline bend radii as small as 1.3 times the external diameter on tube diameters ranging from 3/8″ to 3″. An innovative part separation system combining rear material loading and part storage with a unique micro-joint cutting (MJC) device. The micro-joint cutter separates parts from the skeleton, storing them separately, while the punch press continues to produce parts. The PR/UL automatically removes, sorts and stacks parts; eliminating the need for micro-joints. The last hit of the part perimeter frees the part from the skeleton and vacuum cups on the PR removes the part from the machine table and places it in a pre-programmed location on a skid. The skeleton is removed and placed on a separate skid. 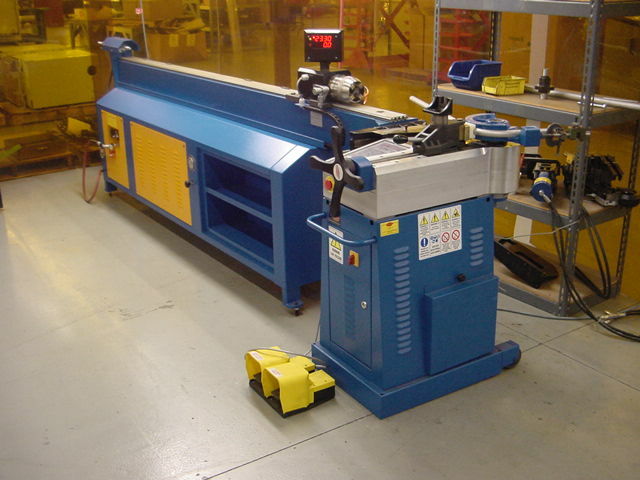 The Astro 100NT is an automated bending system. Utilizing new automation features the Astro is capable of running for extended time periods. The machine comes equipped with a tool changer, automatic gripper changer, automatic hand hanger and a two-cart loading system. A programmable automatic band saw.